This topic contains 3 replies, has 2 voices, and was last updated by Arthur 1 year ago. 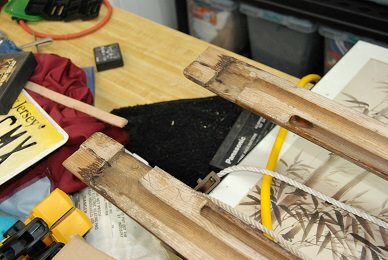 As Mr. Shaw was kind enough to encourage me to Split my mast, I find myself glad I did. 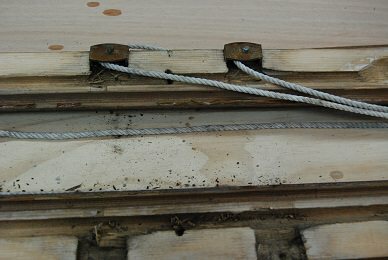 The wooden mast on Spark #5942 came apart easily, requiring no more effort than steady grip, steely fingers, and enhanced fortitude to do the job. To be honest, I had been dreading this particular job as I was treading into the unknown. As this mast came apart so easily, I doubt it would have survived even the slightest puff of air before coming apart with canvass aloft. Thankfully, as you will see, the wood has suffered no rot in it’s 54 years of service, it did contain a multitude of long dead bugs, but they were only using it for shelter and nest rather than as a food source. 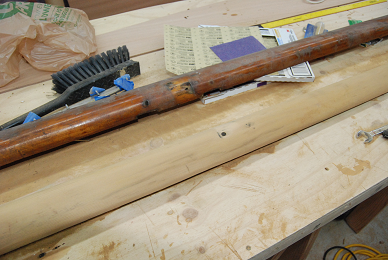 Now to sand her smooth, drill out all the screw holes and fill with wood, and to glue up before varnishing. At some point, Spark’s mast had suffered a repair. It looks well done and quite solid, so I will not be touching it aside from sanding to dry wood and varnishing it again. And of course, the insects that had once called it home. 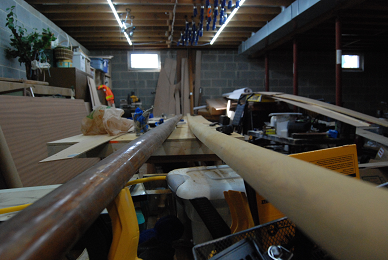 I envy you your mast-length workbench! Almost designed for the job! 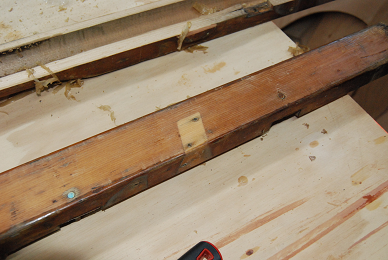 Two of the photos suggest that you might have had a past problem of woodworm infestation. If so, you will of course need to treat it before glueing the mast back together. 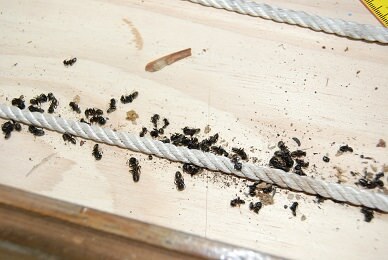 The photos suggest it, but I cannot find any evidence that anything was eating the wood. What is in there appears to be a paper product and the halyards look a bit worse for wear, but the wood of the mast itself, aside from being darkened by whatever the insects used for “glue” appears untouched. 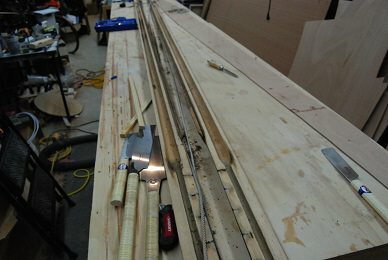 As for my workbench, it is actually designed to help me build a Chesapeake Light Craft’s “Expedition Wherry” , I think Fyne boats in the UK handles their product line. 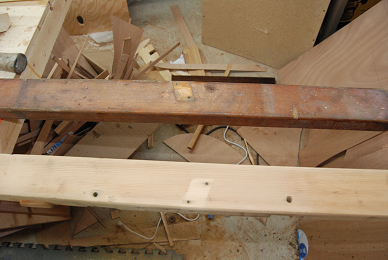 As the Wherry is 17 feet in length, the work bench is just a bit short for the GP’s mast. 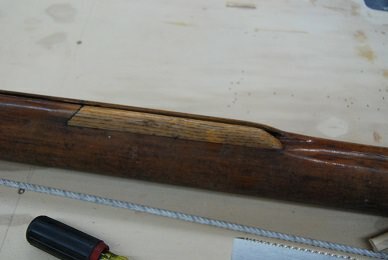 After the better part of an afternoon spent sanding, I find myself bereft of fingerprints and varnish, at least on one half of the mast. 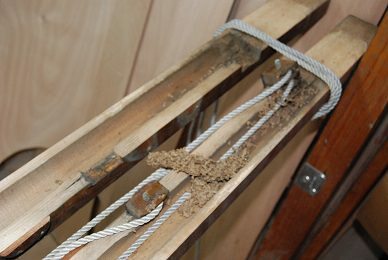 I had originally started out using heat and a scraper, while the worked a treat on the square foot, it was less than satisfactory once the mast went oval. Spark, #5942, is an old gal and will wear her gray with pride. While I did sand most of the dents and scars from the mast, there are some that are too deep to do safely, so she will keep those to wear with pride beneath her new covering of varnish. For the most part though, the sanded half of the mast looks almost new, just slightly darkened with age and some immersion at the foot. No rot, thank goodness, but I will be letting in new wood for all the screw holes. 22.5 feet of lovely looking mast.